Although we often think of an artist's work as a window into their own inner world, that is not always the case. In the life of Peter Ilyich Tchaikovsky, however, we can see perhaps the closest link to be found anywhere between a creative product and the shifting moods of a turbulent soul, which found its outlet through the glorious music created by the great Russian composer. To know his music, you must know the man, and this fast-moving series of eight lectures from an award-winning composer and accomplished teacher offers an insightful look into both the circumstances of Tchaikovsky's life and the impact that life had on his music. You'll learn about his fear of conducting, his disastrous marriage and subsequent suicide attempt, his depression, and the constant anxiety that his closeted homosexuality would become public-a fear that proved prophetic and led to a second, and successful, attempt to take his own life. Torn by the conflicts between his own Romantic inclination for expression and the requirements of Classical structure - he was the first full-time, formally trained, professional composer in Russian history - Tchaikovsky's music is a delicate balancing act. Heart versus head, emotion versus reason, release versus control, the expressiveness demanded of his Russian soul and the strictures of Classical technique - all of these conflicts find their way into his music, and give it its extraordinary emotional power. Robert Greenberg's Great Masters are the BEST "Great Courses" lectures that I have heard until now. I loved Beethoven's courses and I loved Tchaikovsky's as well. Greenberg's style is unique: he speaks full of passion, the characters are well painted, the music is properly inserted.He points out to the music for example-- listen to the oboe, or look how the piano is the superb instrument-- and demonstrates the mood of the author at that precise time-- here he was sad, then he was happy. He retells with music the history of Tchaikovsky's life, his torments, and greatness. Robert Greenberg's lectures are as entertaining as educational. Listen to them. You won't regret! Would you listen to Great Masters: Tchaikovsky - His Life and Music again? Why? I don't know if I would have the time again with all the other Dr Greenberg courses I am listening to. I have listend to about fifty four hours and counting. These courses are most invormative.and give you a very good idea of the composers life and the history of the area in which he lived. What was one of the most memorable moments of Great Masters: Tchaikovsky - His Life and Music? His relationship with Van Meck is very interesting, and the story about his Romeo and Juliet. Have you listened to any of Professor Robert Greenberg’s other performances before? How does this one compare? Ihave listened to Dr Greendergs lectures on Brahms, Stavinsky and how to listen to and understand music 3rd addition I have several others of his courses that I will listen to in the future. Why to long for one sitting. nice to have it in dailey lectures. As usual, Prof. Greenberg has a tremendous grasp of the subject matter. His style is pompous but enjoyable. If you've acquired the taste for his courses, you'll love it. 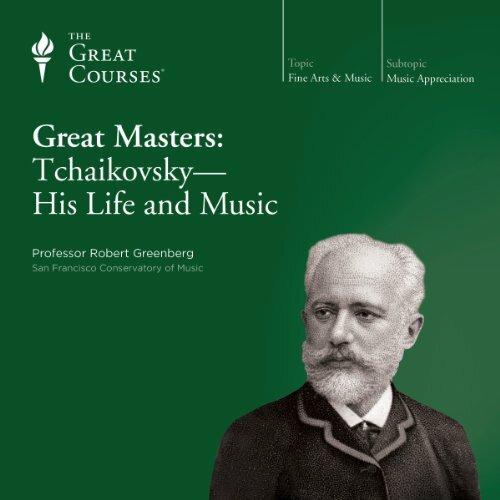 Tchaikovsky - His Life and Music is the third lecture course by Dr. Greenberg that I have completed. His exhaustive research and compelling delivery of the subject matter guarantees that I will be back for more. Plus the packaging of the course which now includes a PDF of the course outline and other source materials really adds to the professional "look and feel" of the Great Courses product. One suggestion might be that Dr. Greenberg could reveal the specific recordings that he uses. He might hesitate to do that for "professional courtesy" reasons, however, I've been an avid listener since "vinyl" and "Hi-Fi" were the buzzwords of the day so I know that some performances accel and some disappoint. So in the spirit of Dr. Greenberg's encouragement of the "noble acquisition" of good music, would it be appropriate to ask for a list of the best recordings that he uses? Truth be told I'm old enough that I already have everything he references on vinyl, cassette tape, CD, and MP3. I'm just paranoid that I might not have the very best! I've truly enjoyed these lectures. They shed light on all the truth about Tchaikovsky which makes you love and respect him even more. The narrator, Robert Greenberg, is fun to listen to and makes potentially boring subject matter very entertaining. Great info on Tchaikovsky. This lecture is superb in historic accuracy, collection of music and depth. It is filled with love of his music and profound understanding and analysis of it. It is no accident that some 25+ lectures of Robert Greenberg's have 4.7+ as their average rating. He is a man of genius and passion with the rare talent of sharing it with any who'd take the time to listen. one day I will dedicate a piece of music to him, and to date I've composed a mere 4 bars in my life. I've never been more excited about music, and I owe that boundless joy to Robert Greenberg. Thank you. The story, the music and Dr. Greenberg's presentation leave me feeling utterly in sympathy and admiration for this spectacularly gifted and achingly haunted Russian composer whose life embodied the same ecstatic highs and crushing despair of his music. Dr. Greenberg: once again, THANK YOU!